Welcome to 10 Years On, the series where we take a look at some of Football Manager 2017’s best wonderkids and how they have developed ten years in the future. In this post we take a look at Ze Gomes. In 2021, German giants Bayern Munich paid £28M for Portuguese wonderkid Ze Gomes. Despite having had Ze Gomes for only five months, Bayern Munich were willing to let him go to Real Madrid for a fee of £62M. Man Utd came in for Ze Gomes in 2024 and brought him to the club for a whopping £81M. Ze Gomes has become one of Portugal’s greatest strikers with many years left still to make an impact internationally. He helped Portugal reach the 2022 World Cup final where they lost to Brazil. To make sure that you don’t miss any posts in this series, or any others on vivalavidafm.com, make sure you follow our blog to receive an email when we publish a post! Just add your email to the box as displayed either in the sidebar (pc or laptop) or below this post (mobile). 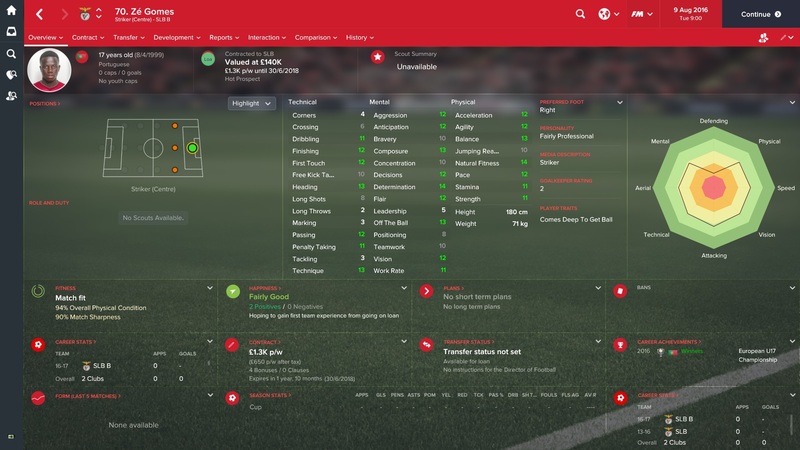 This entry was posted in FM Wonderkids: 10 Years On, FM17 Guides, Experiments & Wonderkids, Football Manager 2017 and tagged benfica, fm wonderkids, fm17, football manager, portugal, primeira liga, ze gomes. Bookmark the permalink.